the very first book appeared in 1987--in fact, I strongly suspect those first Banks books went into the hopper of my aspirations to write an English crime novel, as crazy an idea as that surely was. 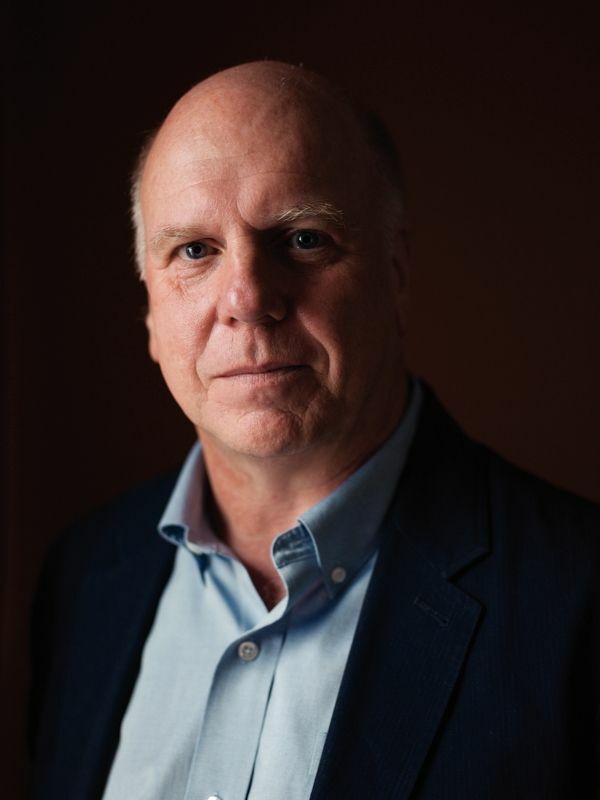 PETER ROBINSON: My latest DCI Banks novel is called In the Dark Places. Its real title is Abattoir Blues, but this is the fifth time US publishers have pressed a title change on me. Even though I strongly suspected it was going to happen, “abattoir” not being a word in common usage in the USA, it still stings a bit. It’s like renaming someone’s child. I suppose I harboured hopes that enough people might have heard the Nick Cave song to go for it. But no. In the Dark Places it became, which rather reminds me of a Gillian Flynn title. At least it doesn’t have “girl” in it. Naturally, I get the flack when someone buys it thinking it’s a new book and finds out she has already read it. That’s me all over, trying to con people into buying the same book twice! Anyway, this is the one about the stolen tractor. I remember the look in my editor’s eye when I told her that, though things improved when I went on to say that there are also dismembered bodies and an exciting chase scene. When I first got the idea for the story, I’d been seeing and hearing a lot of news items about rural crime here in North Yorkshire, where I spend part of each year. The one that really stuck in my mind concerned the theft of 1500 sheep in one night from a farm in nearby Lincolnshire. The mind boggles. The amount of organisation, manpower and equipment needed to pull off such a heist make Oceans Eleven, Twelve and Thirteen seem like child’s play. But they’re only sheep, not money, so the story never got further than the local newspaper. On the other hand, I thought, that’s somebody’s livelihood, and where you have organised crime like that, with so much at stake, you also have the potential for mischief and mayhem, which is my business. Unlicensed slaughterhouses abound (I did consider Slaughterhouse 6 as a title at one point but soon gave up on that) and overseas connections are often involved, the same kind of routes and techniques you find in people-trafficking, where life, human or animal, is cheap. Having a team of detectives at my command is a great way of avoiding boredom, as I can bring a different character to the foreground each time. Of course, Banks and Annie remain the main characters, but in this book, DS Winsome Jackman gets a larger part than usual and we get to find out a bit more about her life. In the next Banks book, When the Music’s Over ( fingers crossed), which should be out next year, the new DC Geraldine Masterson takes centre stage. In a wonderful stroke of irony, one reviewer remarked how apt In the Dark Places is as a title, as it refers to a song by P.J. Harvey, from her album Let England Shake. Much as I admire Polly Harvey, it was Nick Cave’s “Abattoir Blues” I had in mind. Still, Nick and Polly were an item once upon a time, and there’s something very fitting about all that. So what do you think about changing titles in general, and is it Abattoir Blues or In the Dark Places? Does it even matter to the reader (unless she buys the book twice, of course)? DEBS: Here's more about In the Dark Places: Louise Penny calls In the Dark Places "brilliant." Tess Gerritsen says it's "thrilling." And Michael Connelly describes Peter Robinson as "amazing." One of the world's greatest suspense writers returns with this sensational new novel featuring Inspector Alan Banks, hailed by Michael Connelly as "a man for all seasons." REDS and readers, what do you think about the change in titles for an American audience? (I would definitely come down on the side of Abattoir Blues.) Peter will be dropping in to say hi and answer comments this afternoon, and YES, WE HAVE A COPY OF IN THE DARK PLACES FOR A LUCKY COMMENTER! Well, I must admit that I'm a bit curious as to why the publisher feels the title of the book needs to be changed in the first place . . . isn't the author's title good enough? Do readers on this side of the ocean need the title changed to entice them to read the book? "Abattoir Blues" seems like a perfectly fine title to me, but if they insist on calling it "In the Dark Places" it certainly isn't going to stop me from reading it. I always enjoy hearing authors talk about the publishing side of the process. I know other authors who have had titles changed. Usually, they are okay with the changes, but there are certainly times when you already have the right title all picked out. Sorry you aren't happy with this change. I think they are both great titles! Too bad you can't now use In the Dark Places for a different book. Peter... I love DCI Banks. I love the title, Abattoir Blues. I love Debs for bringing you here. And I know I will love your latest book whatever you call it! Fangirl Moment here. HUGE fangirl moment! And ditto everything our Reine just said. Cannot wait to read this latest (by whatever title it needs to be called - although I do think changing the title is pretty sucky). And can I just whine a little that jeeeez y'all, I never win nuthin' - ain't it time, maybe?? Seriously - congratulations on this newest book Mr. Robinson. I hope you continue writing this series forever and ever, and thank you for many years of delicious reading thus far. I second what Kaye said, 19 books already?? Time to catch up with Banks and company. The title change is never fun--it's YOUR baby, your labors delivered it, and yet someone else gets to say what it should be named. On the other hand, I'm pretty squeamish--and Abattoir Blues sounds like a bloodbath--I might hesitate to pick it up. In the Dark Places clues me in that this isn't a cozy and I should be prepared for the, well, dark side of human behavior. Even without being familiar with your name as author, I'd still pick the book up and check it out as a potential purchase. Echoing Kaye's comment with a question. Who decides the title needs to be changed for us over here? I had a lot of fun bringing home a copy of Harry Potter and the Philosopher's Stone from Blackwell's. I was the envy of my friends and tutees. Oh, how terrific to see yo here to day--I am SUCH a fan! Wow. Congratulations on everything. May I ask a process question though--(as a non-outliner who is on page 300 of my new book and flailing the littlest of bits)--do you outline? Or not? I like "Abattoir Blues," but it does depend on the reader mentally substituting Slaughterhouse to make it work. And we Americans don't know from abattoirs. I'm a huge DCI Banks fan. The first series novel I read was Friend of the Devil. It left me stunned. Brilliant plotting and characterization. I love that name, Winsome. So evocative. How did you find it? And have 'they' ever tried to get you to change a character name. I enjoy your books and the DVD's of them. It's a shame about the title but with "DCI Banks" on the cover, no worries. Typically, the title is changed because the publisher feels that the original title will be confusing to readers in another geographical location. This has always seemed like it was talking down to readers, as if we are not intelligent enough to "understand" the original title. Makes my blood boil. I also think that rarely does the title change when an American book goes overseas. Don't quote me on that, but I can't think of an example where that happened off the top of my head. If it were true that readers may be confused, that would work in both directions, so I just don't understand. Abbatoir Blues is a wonderful title. In the off chance that someone didn't know what an abbatoir was, couldn't they look it up? And learn something. Has anyone ever NOT bought a book because of the title? "Gee, that sounds like a great book and I love that author, but what is with that title? I think I'll skip this one." I think both titles are great. Abbatoir Blues is catchy - but confession. I think of myself as having a pretty extensive vocabulary, but I had to look up "abbatoir." Would that keep me from picking up the book? Probably not. It does sometimes frustrate me that American titles have to be "dumbed down." Like the Philosopher's Stone. Why? I see I have more books to put on my TBR pile, though. How did I not know this series?? Sometimes I wonder where I have been . . . Is there a TV series? DCIBanks sounds familiar. Personally, I know the meaning of the word abbatoir but I might not pick up a book with that word in its title. It connotes "bloodbath" to me. Still, I read all sorts of gory stories . . . maybe I am fooling myself!! Yes, Denise. The DCI Banks series has been adapted to television. Quite a good show, but doesn't live up to the book in my opinion (they rarely do, huh). Yeah, Mary, I was thinking about the Philosopher's Stone thing too. I mean, really, Sorcerer's Stone? Huh? Did the US publishers not KNOW about alchemy when they made that change? I've always really liked Peter's female characters--Annie Cabot, Winsome Jackman, and now looking forward to seeing more of DC Gerry Masterson in the next book. And I hope Peter gets to keep the title on that one!! I've only had one title changed, not by a different publisher but by my primary U.S. publisher. My original title for Mourn Not Your Dead was One Blood Will Tell. I still like the original title better! Peter, do you start with a title from the very beginning? I do, otherwise it doesn't seem like a book. What a pleasure to have Peter Robinson here today! Like a lot of other crime fiction writers, I'm huge fan of DCI Banks. I like Abbatoir Blues without knowing the Nick Cave song because I love the word abbatior. Used it myself in a book where someone's up to mischief in a beef slaughterhouse. That being said, In the Dark Places is a delightfully shivery title, albeit little generic. Readers probably will wind up referring to it as "the one with the tractor!" I do know abbatoir, but only because it was used in someone's book . . . I love when a book teaches me new words. I know there were changes in the Harry Potter books and am glad they didn't change everything. Hello Peter. I'm so looking forward to the new book, but you should have put 'girl'in the title! Guaranteed number one bestseller! I haven't seen you since the atV show came out so I'm curious to know whether you are happy with the casting etc. they seem to have picked up the flavor quite well to me. Well, I like both titles but Abattoir Blues is a great title! Love DCI Banks and Peter's writing. Huge can for many years now. Did I just insult the author by using the word many. Hmmm. Looking forward to reading another Banks book. Peter is a very descriptive writer and I like that. I really get into the character and story. fan not can. Need an edit button. The first thing I thought of when I heard "In the Dark Places: was, didn't Deborah have a book with a similar title? How confusing! And I really love Peter Robinson's DCI Banks! I think the audience for his books will understand the title "Abattoir Blues". Maybe the publisher was afraid readers would expect a novel set in New Orleans. In a Dark House, yes, that's the first thing I thought, too. And we have the same publisher... But it's been a while since that book. The title doesn't matter to me, just the fact that the author is Peter Robinson. I will always read his next book, no matter what it is called! The title doesn't matter to me, just the fact that the author is Peter Robinson. I will always read his next book, no matter what it is called. Thanks you all for writing. I'm sorry but I can't seem to do this. I tried once and it disappeared when I tried to prove I wasn't a robot. I don't do Facebook or Google accounts or anything, so I don't which box to tick. Anyway, if by some miracle this should get through, I'm glad most of you don't seem to care what the title is. I agree that the main thing is to enjoy the book. It just gets a bit frustrating for the writer, as some of you noted. And Hank Phillppi Ryan, no, I don't outline. I LOVE DCI Banks in every way!! I got hooked on his books and love the program too! Love Alan Banks and his crew...and love Peter Robinson, who I think is one of those very under-appreciated writers. I don't know why he is still not as well-known as he should be! I do love this series and already have this book. Like Debs I enjoyed spending more time with Winsome ... even if it was a bit hair raising in those dark places. Title changes can be a problem for readers waiting for a particular book, but I don't think In the Dark Places for Abattoir Blues was half as irritating as Final Account for Dry Bones That Dream. What were they thinking? A special favorite of mine is In a Dry Season. I read it again in the past couple of years when the severe drought in parts of the country began revealing the fates of a number of runaway teens and missing spouses. I definitely prefer the books to the television version. Hurray! I am renewed, I am delighted, I have new confidence. Thank you, Peter, and I will confirm you are NOT a robot! I am a huge fan of the Inspector Banks series. Kudos, Peter, on another great entry in the series. You have a masterful way of starting out with a seemingly run of the mill crime and then developing that into a deliciously complex mixture of top notch mystery & detection. Thanks for giving Winsome a bigger part this time! For the record, I hate when the publishers decide to "dumb down" the title for American readers. I thought Abattoir Blues was a brilliant title! 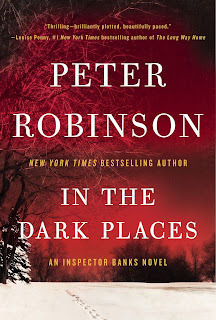 I am thrilled (and a little ashamed to admit) that I just recently "discovered" Peter Robinson and DCI Banks. While I cannot believe I have missed out on a great writer and character(s) for so long, it is nice to have so many books waiting for me as opposed to me having to wait for the next one to come out. I tend to prefer the British titles to American ones (meaning books, but maybe the aristocracy as well come to think of it) and ABATTOIR BLUES is no exception there. Since I have been a regular on this blog, my TBR pile, which was already out of control, has grown to impossible proportions. Having said that, I have never been steered wrong by the books and authors that come across this blog. So, now, it looks like I have nineteen DCI Banks books to add to my catch-up list. As for titles, I love Abattoir Blues, and I would be quite annoyed if I were the author and a title that I took great care to choose for my book had to be changed. However, I think that most people read a book for its content and not its title, so I don't see a change affecting how a book sells. Lovely comments! I'm thrilled to know there are so many readers out there who love DCI Banks and his team as much as I do! And thanks, Peter, for dropping in despite the technical difficulties! The technical difficulties are all to do with my incompetence, Deborah! I'm not a technophobe or a Luddite by any means, but of these more public platforms cause me a problem or two. Anyway, it was fun to read all the comments. Nice to hear from you again, too, Rhys. It has been a long time. The DCI Banks series will be back next year, but they're no longer adapting my books. Now they're coming up with original stories and, of course, they're not as good :-) I like Stephen Tompkinson as Banks, even though he doesn't "look" the part to me. He's a good enough actor to bring it off. But the TV thing is parallel universe, like Fringe, and I have to get to the one where I live and write books. All the best to everyone. I'll try my name this time instead of "Anonymous" and see what happens. Lesson learned! Never skip your Jungle Red fix or you may miss one of your all time favorite authors. I am a huge fan. I have read all of Peter Robinson's fine books. "In a Dry Season" is on my top ten list of mysteries. I hate when they change titles. It confuses me because I sometimes buy earlier over at Amazon UK. And personally, as a writer, it feels like baby-switching in the nursery to me. But when it comes to a book written by Peter Robinson, I'm going to read it regardless of the title! I had one question which I may be too late to have answered, but here goes. Why did my friend Inspector Banks switch from listening to classical music and opera to more modern music? I'm catching up with these because I was out of the country and then at Bouchercon, so I'm way behind. So probably no one will ever see this. But I did want to say that while "abattoir" may be an unfamiliar word for many, perhaps it's a regional thing? I grew up in piedmont North Carolina, and I remember my mother (born 1920) and her sisters pointing out to us kids where the abattoir was in High Point or Thomasville along a road that became I-85. And abattoir was what they called it in the 1920s and 1930s. 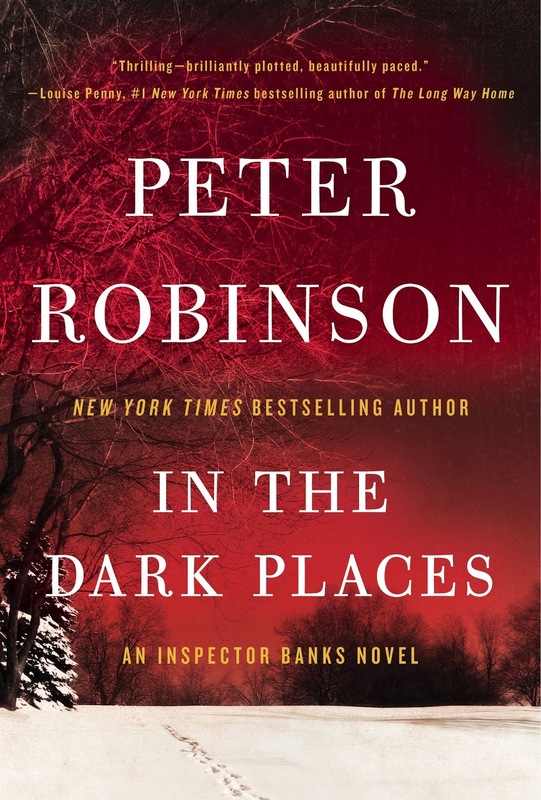 Also, I really like Peter Robinson's books and have read all the DCI Banks ones. Discovered him when PBS carried the DCI Banks series.